An Chomhairle um Oideachas Gaeltachta agus Gaelscolaíochta was founded under the provisions of Article 31 of the Education Act of 1998 following a campaign led by Comhdháil Náisiúnta na Gaeilge, Gaelscoileanna & Eagraíocht na Scoileanna Gaeltachta to establish a structure to cater for the educational needs of Gaeltacht schools and of Gaelscoileanna. There are functions also in Article 31 relating to the teaching of Irish in the country’s other schools. 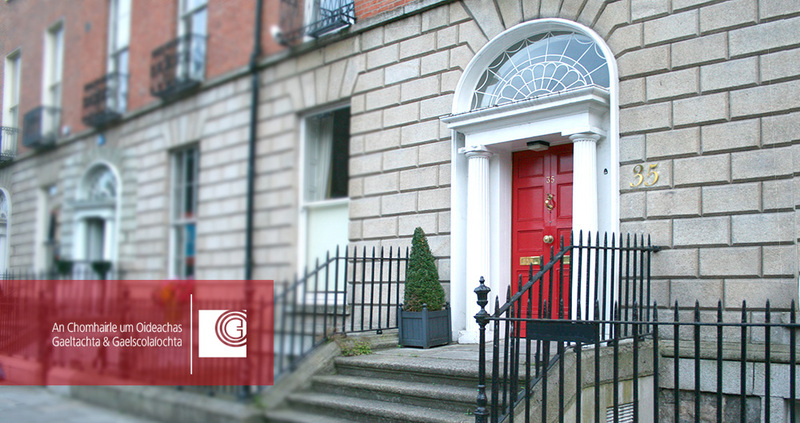 The Comhairle members – parents, teachers and other experts – were appointed in March 2002. The Chief Executive was appointed in October 2002, an Administration Executive in April 2003 and a Researach Assistant in 2005. Other jobs were advertised a couple of times since but they were not allowed to be filled. The 2nd board was appointed in 2006 and the 3rd in 2010. To fulfill effectively, professionally and at a high standard the responsibilities of An Chomhairle um Oideachas Gaeltachta agus Gaelscolaíochta for the development of the Gaeltacht and Irish medium sector and the teaching of Irish in all schools. Appointed Chief Executive of An Chomhairle um Oideachas Gaeltachta agus Gaelscolaíochta in 2002. She spent many years as a post-primary teacher of Irish and learning support and was involved in curriculum development during those years. She is a re-assigned post-primary schools’ inspector. Aisling was appointed Chief Executive Officer in January 2018. She spent over five years working in the Finance Department of Foras na Gaeilge. Prior to that, she worked as Executive Officer with COGG from 2003 – 2012. She secured an MSc degree in Business and Information Technology in Dublin City University. Aisling spent eight years working in the tourism sector after spending years abroad. Appointed Research and Publications Assistant in 2005, having previously spent 6 years as Research Assistant in Institiúid Teangeolaíochta Éireann. Having been awarded a doctoral degree by the University of Ulster in 2005, he was a member of the team working on the Collins Gem Irish English dictionary. Pádraig was appointed as an Education Officer (Post-Primary) with COGG in 2016. In 2011 he was awarded a Postgraduate Diploma in Education and spent the next 5 years teaching at post-primary level. He has also worked as an freelance Irish translator. He has a keen interest in how technology is developing and how it can be applied to Irish. In 2016 he was awarded a Professional Diploma in Digital Marketing and Strategy. Robbie was appointed as Primary Education Officer with COGG in 2018. He graduated in Irish with Computing in 2010 and went on to complete his PGCE through St. Mary’s University College Belfast in 2011. He spent 7 years working as a primary school teacher in the North of Ireland. He was appointed as an Education Adviser with Twinkl Educational Publishing in 2016 and then as Teaching Team Manager in 2017. The members of the current Comhairle (parents, teachers and other experts) were appointed for a new term of office ending December 2018. The role of An Chomhairle is to enact the provisions of Article 31 of the Education Act (1998). Cathnia Ó Muircheartaigh Gaelscoileanna TEO. Bláthnaid Ní Ghréacháin Gaelscoileanna TEO. It is the policy of An Chomhairle um Oideachas Gaeltachta & Gaelscolaíochta (COGG) for an internal quality audit system to be in place in line with the best practices recognised in the state in accordance with the Department of Finance. This internal audit service is provided to An Chomhairle um Oideachas Gaeltachta & Gaescolaíochta by a qualified accountant. Review, on a regular basis, the financial accounts and internal control systems within COGG and provide recommendations for amendments or improvements where necessary. Attendance at both meetings each year with the Audit Committee, to report to the Committee and to answer questions on all accounts and financial practices. In the case that An Chomhairle um Oideachas Gaeltachta & Gaelscolaíochta makes a purchase order over €20,000, all the information will be published on this site. COGG complies with the legislation on access to environmental information and the Freedom of Information Act. COGG complies with legislation on faoi access to environmental information and the Freedom of Information Act. Our Nós Imeachta and Coimhlint Leasa are available to read.